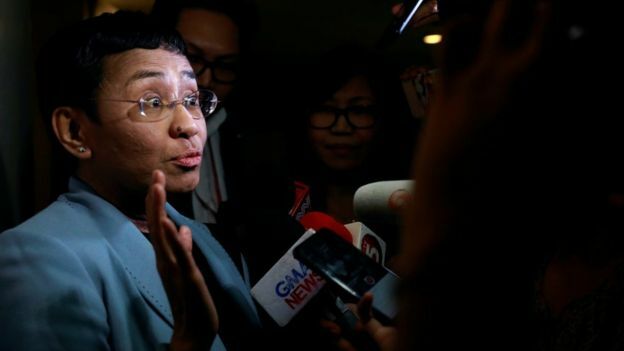 Philippines journalist and editor of online news organisation Rappler, Maria Ressa, has been arrested in Manila on the back of what is termed in that country as cyber libel. The case is one of several mobilised by the law enforcement agencies of the Philippines against Maria Ressa who has been a thorn in President Rodrigo Duterte’s side for several years. She is also facing accusations of tax fraud and has only recently posted bail on those charges. More details in this BBC News story. Maria Ressa was in London last November speaking at a meeting of the London Leadership Council of the Committee to Protect Journalists. At that event, she said she was perfectly aware of the risks she faced but she could not let the danger she was in to stop her from investigating the government of the Philippines and to provide the public with honest information. The truth is hard to come by in the Philippines media as most other news organisations habitually avoid confrontation with the government that is conducting a “war on drugs” that is estimated to have left more than three times the official estimate of 5,000 people. Here is a link to a post I published when I met Maria Ressa in London late last year.